CONTACT US TO BOOK YOUR GETAWAY TODAY! *Applies to new 2018 and 2019 bookings only made by 10/31/18 and will not be applied to pre-existing bookings. Not applicable to custom tours or on TBA space. Offer reliant on space availability and may be withdrawn at any time. Full cancellation penalties will apply. Additional restrictions apply. ** Book and deposit a new 2019 Globus Europe, South or North America (excluding Cuba, 2020 Oberammergau and Escapes by Globus) vacation to save 10% per person on the land-only portion of the core tour not including extra night accommodations, extensions, taxes, fees, tips or supplements. Booking must be made and under deposit by 11/27/18 for travel in 2019. Additional restrictions apply. 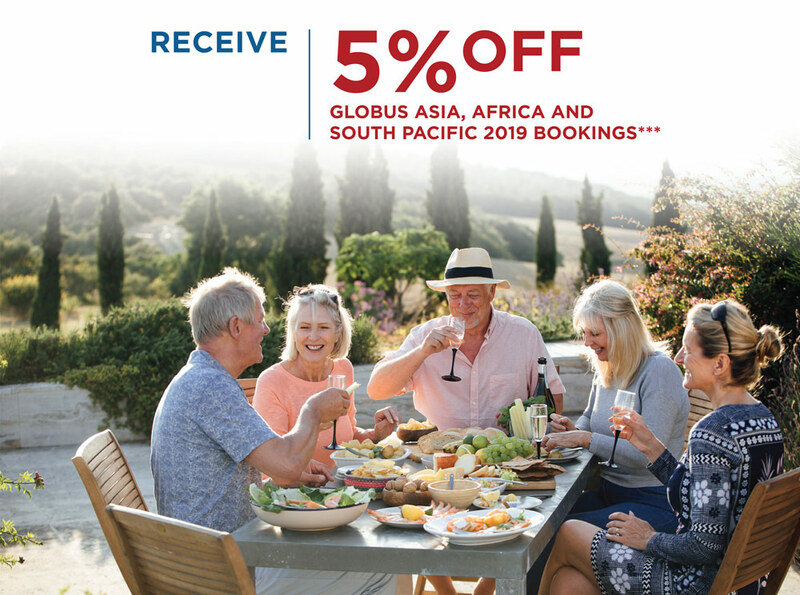 *** Book and deposit a new 2019 Globus Asia, Africa and South Pacific vacation to save 5% per person on the land-only portion of the core tour not including extra night accommodations, extensions, taxes/fees tips or supplements. Booking must be made, under deposit and discount applied by 11/27/2018 for travel in 2019. Additional restrictions apply.